I cringed at the thought of turkey bacon when Jess brought it over for breakfast the other morning. The last time I had it, we cooked it for 40 minutes hoping it would crisp. It just sat there, a wobbly mess and a poor excuse for a piece of bacon. Since that day, I vowed never to have turkey bacon again. But Jess insisted, so I let her go. It wasn’t that bad. For some magical reason, she knows how to make turkey bacon crispy, or maybe they’ve just perfected it since that fateful day. Either way, a half a pound of turkey bacon was left in my fridge and I had no idea what to do with it. I mean, if I’m going to have eggs and bacon for breakfast, I’m going for the real stuff. So I was poking around the fridge for a dinner idea yesterday, and I eyed my avocado and the ground turkey sitting there all lonely. Then it hit me, tacos. But not any tacos, California-inspired tacos. So I cooked up a piece of turkey bacon for each taco, one a piece. Then threw a quarter pound of turkey into the saute pan, added cayenne, garlic powder, cumin, and black pepper until it started to taste like the tacos I know. While that browned, I sliced an avocado up and diced a tomato. 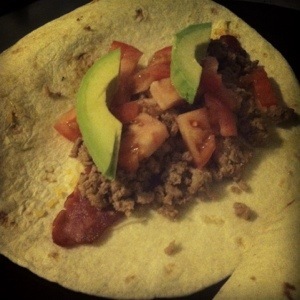 I microwaved the flour tortilla for 30 seconds, then topped it with a sprinkle of shredded cheddar cheese, the slice of bacon, ground turkey, tomato, and avocado. It looked delicious. So I pushed away my fears of turkey bacon and took a bite. It was amazing, and I will totally be making these again. Hands down was healthier than when I usually make tacos and I got the illusion of bacon. Fabulous! Try them and let me know what you think.